CARRIE is the novel that brought Stephen King to the prom (so to speak), and for many people it is easily one of his most resonant works. With a classic movie by Brian De Palma, a television movie remake, a sequel in 1999, and even a Broadway musical, the novel certainly lends itself to adaptation. King hasn't written a novel quite like CARRIE. Most of his works deal with a male protagonist, commonly a writer, and CARRIE feels like something outside his wheelhouse in comparison to his other works. There are themes in CARRIE that King returns to often in his other stories, but what's most unusual (and what works best) about the novel is that King has a real sense of sexual politics and power, and he makes high school feel scarily accurate, the hell that it can be at times. King really got under the skin of his protagonist, a very lonely girl who discovers her own avenues of power. It's also safe to say that in his long and illustrious career, he's never written anyone quite like Carrie White, not before or since. Because she's one of King's most complicated, multifaceted characters, Carrie White is an actress's dream role in many ways. Sissy Spacek was terrific as Carrie in Brian De Palma's wonderful film. It seems unfair to compare the two films - De Palma has a style to his filmmaking that Peirce simply doesn't have, not at this stage in her career - but it also seems inevitable, because Peirce's CARRIE follows the same road map to a fault, plotwise (and I found it unfortunate that with the increased budget that Peirce's CARRIE doesn't go into the much larger scope climax of the book), so all that's left, really, is to compare performances. And I've been wrestling with it for the few hours that I've seen the CARRIE remake, but I'm going to just come out and say it - I think Chloë Grace Moretz's perfromance is better than Spacek's. Perhaps she tapped into her youth in a way that Spacek didn't, or was able to give us more of a glimpse into Carrie White's inner world, but Moretz is fantastic. She breaks your heart at the same time you cringe from the power of her work here. There were moments where I reacted because Moretz reminded me of my own daughter in some ways, and her performance is both disturbing and earnest. Moretz truly knocks it out of the park. Julianne Moore, as Carrie's mother Margaret, has a broader role to play. Consumed with religious fervor, Margaret could easily slip into caricature, but Moore keeps her focused, with the exception of a few scenes. She's believable and even frightening, but Moore also keeps her grounded and Peirce makes us feel the years of abuse that Carrie undergoes as her daughter. Carrie doesn't even realize it as abuse, but simply how people live, and when she gets her moment in the sun, her first true taste of freedom, we cannot blame Carrie for what happens next. Moretz finds a deep truth to the part and Peirce's best work in CARRIE is letting that emotion come through. De Palma's film had sadness in it, yes, but I don't think to the degree that Peirce's does. These characters breathe, all of them, including the supporting cast - Gabriella Wilde as Sue Snell, Portia Doubleday as the jealous Chris Hargensen, Judy Greer as Rita Desjardin, and Ansel Elgort as Tommy Ross. If there's a weak performance in the movie, it's Alex Russell as Billy Nolan, but that character just moves the plot forward anyway. 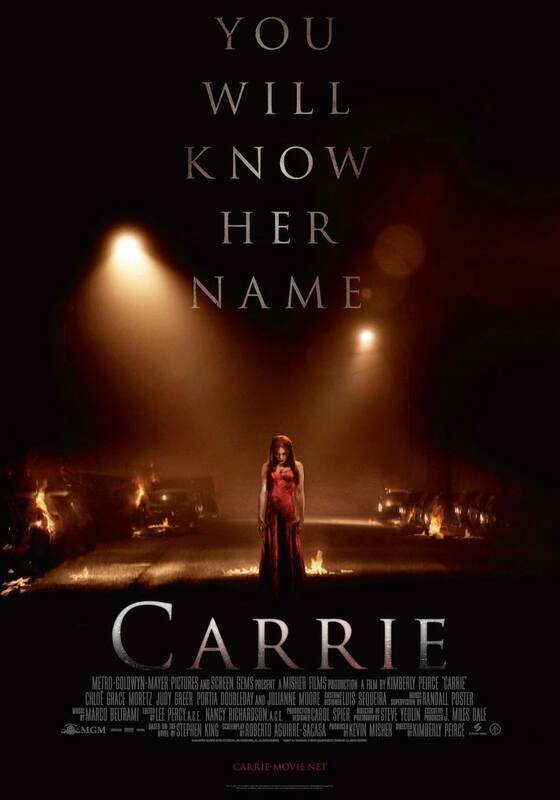 The problem with CARRIE is that Kimberly Peirce is trapped by the story she has to tell. Note for note, the movie is an exact copy of Brian De Palma's. Not in style, surely, but definitely in plot, and the movie could have benefited from a few trips off the reservation. There are a few moments where it doesn't feel like a carbon copy, but not many (the use of cell phones and YouTube come into play here in interesting ways that make the film feel timely). CARRIE seems especially relevant today thematically. But the film could have used some of Stephen King's scope in the final act - in the book Carrie White practically destroys the town, and the movie could have broken from De Palma's version and demonstrated that. Sadly, it doesn't. The use of CGI is too much, when practical effects would have sufficed (and been far scarier). If they were going to use all that CGI, they should have put it into Stephen King's original ending. De Palma's film also had no reservations in its portrayal of the infamous shower scene, and Peirce unwisely holds back. It's meant to be an uncomfortable, difficult scene to watch, and Peirce, unfortunately, doesn't have the bravery to go to the dark places that De Palma went in that scene. The unseemly, exploitative nature of De Palma's direction gives that scene real power, but Peirce, possibly out of respect to her actors, doesn't go that far. She waters down an integral moment, and that may have been to the benefit of he audience and to the actors, but it doesn't have the strength of the original. It's a far different world today than in 1976, and audiences, especially young audiences not familiar with the original, may be turned off by the brutality of it. The trade off, though, is that scene in the remake doesn't resonate nearly as much. That's not to say CARRIE is another unnecessary remake - it isn't. Kimberly Peirce (with the screenplay by Lawrence Cohen and Roberto Aguirre-Sacasa) gets to the soul of these characters in a way that De Palma did not; in Peirce's other films BOYS DON'T CRY and STOP LOSS, she has remarkable empathy for her characters, and it certainly shows in CARRIE. Peirce gets what a tragedy CARRIE is, and even during the movie's final horrific moments she never forgets it. The movie may be a paint-by-numbers remake of De Palma's, but she certainly uses many rich colors. If only she'd painted a little outside the lines, I think her film could have potentially been quite something. You can safely ignore the final homage to De Palma's movie before the credits roll. Peirce doesn't have De Palma's style, but she has heart to spare. CARRIE could have been a worthless endeavor, and at times, it comes close to it. But it's the performances, especially the stunningly good Chloë Grace Moretz, that are the movie's saving grace.